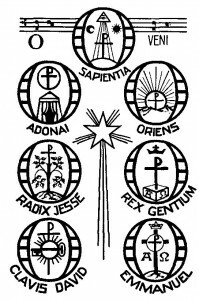 One of the beautiful parts of the Advent Season are the “O Antiphons”. These occur during Evening Prayer. Towards the end of Evening Prayer, we rise and chant the Magnificat, Mary’s song. (You know these antiphons–I’m sure. 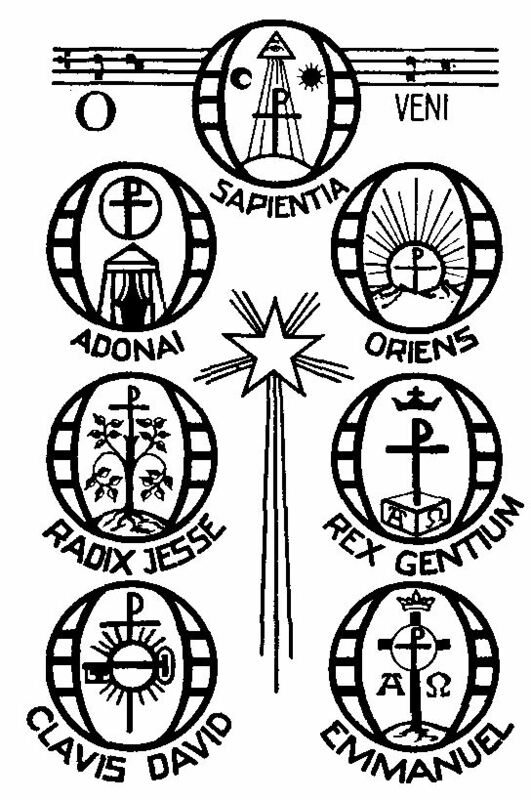 You sing them often enough–the antiphons, together, form the Advent hymn O Come, O Come, Emmanuel.) Before we chant, the cantor intones a small versicle that will prepare us to chant this piece of scripture. This versicle is called the antiphon. The O Antiphons occur in the evenings between December 17 through December 23. These special antiphons illustrate Isaiah’s prophecy of the coming of the Son of God as a child among us. They are deeply Christological and magnify certain parts of our theology pertaining the Son of God. In my reflections in the bulletin, I will offer three concise thoughts about three of six O Antiphons that occur during this time of year. 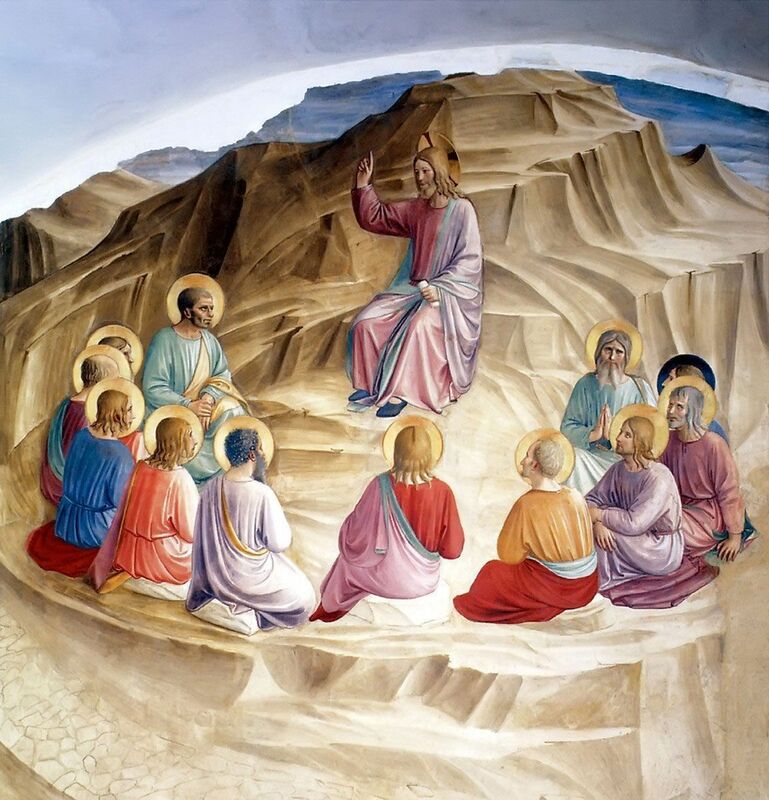 Here, on the blog, I hope to expand some of my thoughts about each antiphon. 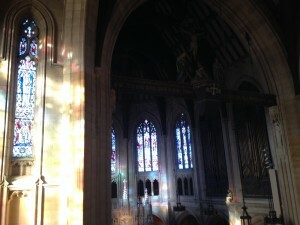 I pray that these reflections prepare you well for the Great Day of Christ’s Mass. 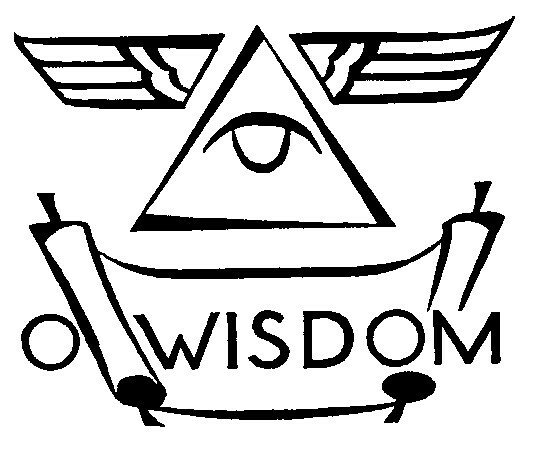 Jesus Christ is indeed Wisdom, the physical manifestation of the Wisdom of God. God the Father spoke the Word of God, Wisdom Himself, upon the world. 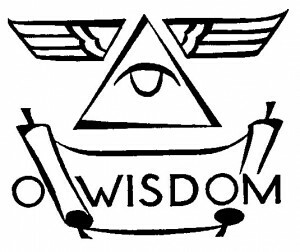 Wisdom Himself is the agent of creation, the Word that created all things. This harkens to the prologue of the Gospel of John primarily. There was no time in which the Second Person of the Most Holy Trinity was not. The Second Person is just as powerful and eternal as the Creator God and the Spirit of God. The Creator God spoke the Word, the Second Person, and creation was made manifest. The Spirit of God was breathed into the world, and into each one of us, making us and image and likeness of the Creator. Jesus spoke, and we were made. We were intentionally made, thought of, spoken of, and given to the world as a gift. We are not an accident. We are not a random blaring of atoms. We are intentionally and wonderfully made by a God who loves us. When the Son of God was made a human being, he came to us to teach us how to live and how to die. We learn how to live a virtuous life by meditating upon his every word and action. We imitation him in order to become a reflection of our God. Giving Tree gifts due soon! Our Christmas Giving Tree has suggested gift items on angel tags, such as toys for children, gift cards for families, and clothes for our folks at Lima Center. All items are to be given to us unwrapped. We have a day set aside called “The Christmas Store” when parents are invited to come and pick out an item for each child in their family. Plus they receive a box of groceries and a food gift card. Saint Ignatius College Prep High School students, staff and families help us with donations and on the day we distribute. Please have the items turned in by Thursday, Dec. 19 at 9:00pm. You may leave your items in the office or bring them to the Family Christmas Pageant on Sunday, Dec. 15, or to the Parish Christmas Concert, on Monday, Dec. 16. It is a gift that we are all able to work together to help others celebrate this beautiful feast of prayer and gift giving. Okay, so the Solemnity of Easter moves dates. Which means Ash Wednesday moves dates. But Christmas doesn’t. Why is that? Why is Christmas December 25? There is one theory saying that, in the early Church, December 25 was the feast of the Roman Sun god. This is reasonable—we are, in a way, baptizing these Roman feasts. However, for me, this is not a good reason. Basically, the reason I’m not a fan of this reasoning is because….it’s not a Jewish reason. It is not a reason embedded with Jewish undertones or with Jewish liturgical praxis. Jesus is Jewish—why would Jesus care about some pagan, non-existent god? The Church Fathers, pondered this question rather well. Many of the Church Fathers, linked Jesus’ death—Good Friday—with His Incarnation. In other words, some patristics linked Jesus’ Incarnation, the feast of the Annunciation, to the day he died on the cross. 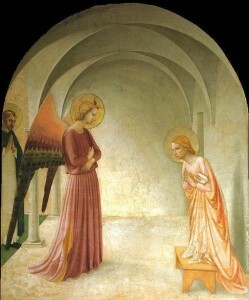 His Nativity is explicitly linked to his Annunciation, which is explicitly linked his Passion. Tertullian reported an estimate that the 14th of Nisan was on March 25. That the day Jesus was sacrificed on the cross was the day that the Angel Gabriel visited Mary. March 25. 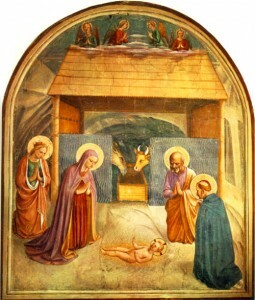 Thus, nine months later, Jesus would be born. Christmas Day. December 25. Thus, 40 days later, he would be presented in the Temple. Feast of the Presentation. February 2. There is also another reason people front December 25 as Christmas. 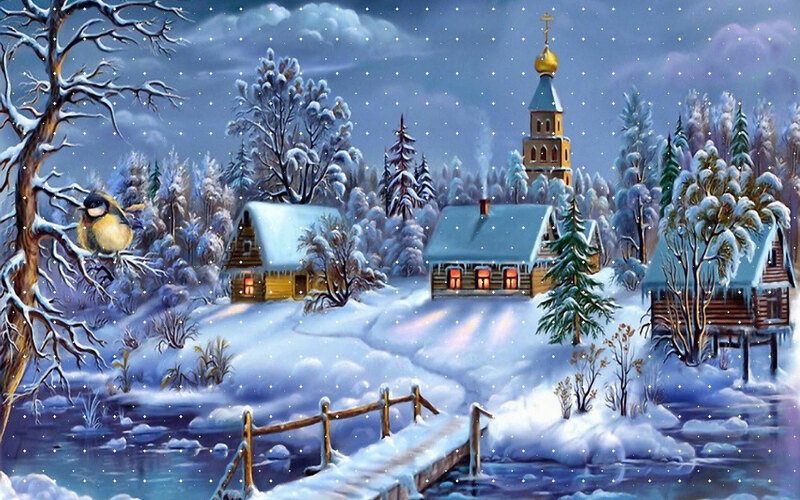 December 25 is roughly the winter solstice, the shortest day of the year. June 24, the date of the summer solstice, is the longest date of the year. John’s most important saying is that I must decrease, so He must increase. John, the prophet of the Lord, is decreasing so that the Light of the World, Jesus Christ, may increase and be the light of the World. Please refer to this link. I thank Biblical Archeology for this insight. The Western Dominican Province’s Vocations Office has a great Facebook presence. If you look at their visuals, many of their pictures are in black and white. This is not merely to evoke an old-school motif, but rather, it’s because we’re Dominican. 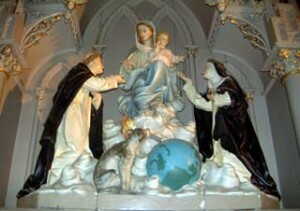 The Dominican color scheme is black and white. And of course, like all things Catholic, the colors symbolize something. Now what do they symbolize? Virtues that the Order holds very dear to our hearts, namely, humility and purity. According to the Christian, Medieval color palette, black symbolizes humility. Obviously, when we think of the color black, we think of death. Humility can count as well, simply because death reminds us that we are not immortal, we are not infinite, that we have limitations, that we are weak. Humility reminds us that God is God and we are not, to paraphrase Saint Catherine of Siena. 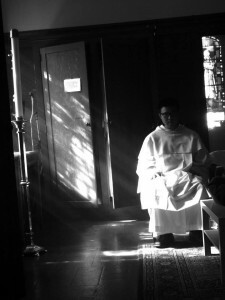 The Dominican spends his life contemplating the Mystery of Truth, Jesus Christ. Yet we intuitively know that God speaks to us through his infinitude. As much as God tells us, we can only take in so much. We can only understand so much. We can only love so much. It’s a humbling thing to be confronted by the Infinite God. White symbolizes purity. Today, when we think of purity, our oversexed culture thinks of sexual purity. However, the Dominican is called also to a different type of purity, that is, intellectual purity. (Pope Benedict writes about in his Jesus of Nazareth trilogy.) When Dominicans talk about intellectual purity, we remember that we need to speak, think and ponder with God’s point of view, and not ours. Our point of view is contaminated with our own presuppositions, our culture, our misunderstandings of reality, our sinfulness and our limitations. That God is greater than our mindset, wiser than our intellect, and more elegant than any equation we can conjure. When the Dominican studies the Truth, we must do our best to do away with any presuppositions that we may have in order to contemplate the Great Truth. Intellectual purity is a call for the Dominican to shed our presuppositions and put on God’s. Black and White. The colors of the Order. Two virtues that we strive for, yet, in this life, will never fully attain. 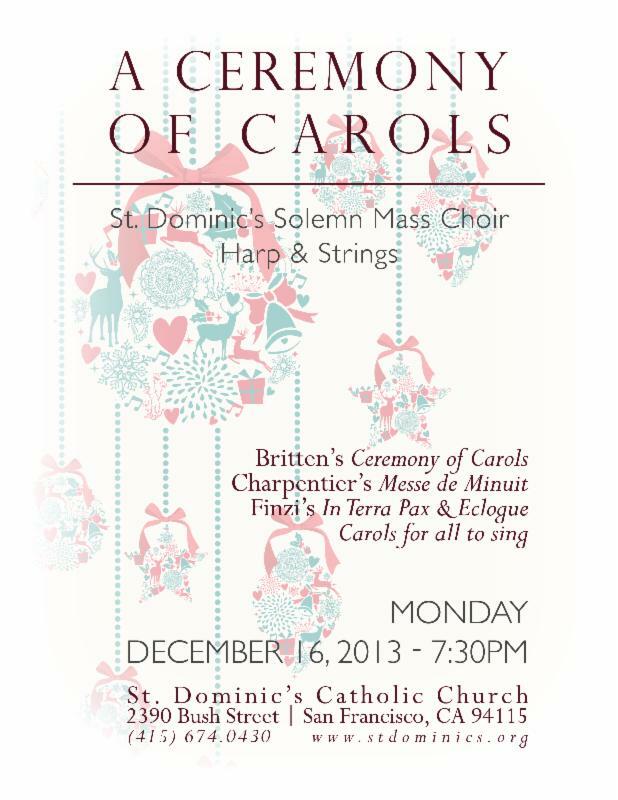 Our upcoming concert is soon approaching! It features many artists you already know and love, including members of the Solemn Mass Choir of the 11:30 Mass. 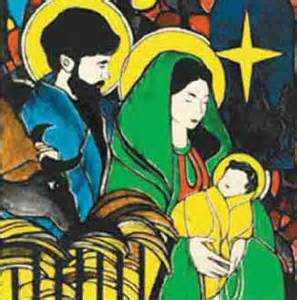 All ages are invited to a children’s costumed portrayal of the Christmas story, including carols and a bilingual Las Posadas procession in the Hispanic tradition. A small petting zoo will start at 2:45pm in the parking lot. The play begins in the Lady Chapel at 3:15pm. 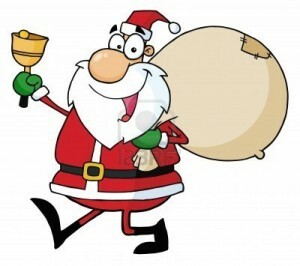 The party afterwards will be in the Parish Hall, where you can deliver your Giving Tree gifts. Finzi’s musical inspiration sprang primarily from his love of literature and the English countryside – the same sources that inspired Elgar and Vaughan Williams. In Terra Pax was composed in 1954 and was almost the last piece that Finzi wrote, though its genesis can be traced to an event some thirty years previously, when one Christmas Eve he had climbed up to the church at the top of his beloved Chosen Hill, between Gloucester and Cheltenham. The sound of the midnight bells ringing out across the frosty Gloucestershire valleys evidently made a lasting impression on him, retrospectively providing the idea for In Terra Pax, as he told Vaughan Williams. The work is a setting of two verses from Robert Bridges’ fine poem, ‘Noel: Christmas Eve, 1913’, subtitled Pax hominibus bonae voluntatis (Peace and goodwill to all men), which Finzi imaginatively and skilfully uses to frame St Luke’s account of the angels’ appearance to the shepherds. In Terra Pax is subtitled ‘Christmas Scene’, and Finzi explained that ‘the Nativity becomes a vision seen by a wanderer on a dark and frosty Christmas Eve in our own familiar landscape’. This placing of the Biblical story into an English pastoral context is entirely consistent with Finzi’s close affinity with the English Romantic tradition, and his lifelong dedication to the creation of his own rural paradise at his home in Ashmansworth, near Newbury. The two soloists and the chorus have clearly defined musical roles; the baritone soloist takes the voice of the poet, the soprano is cast as the angel, whilst the chorus narrates the familiar biblical text. In the opening section the poet is standing on a hill contemplating the events of the very first Christmas, the sound of the distant church bells becoming for him the sound of an angel choir. This image is expressed in a pealing-bells motif which, together with the refrain from ‘The First Nowell’, provides the musical fabric of the piece. 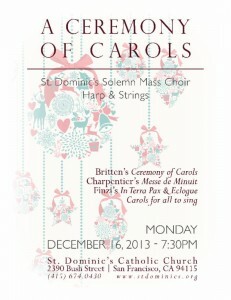 All are invited to our Christmas concert on Monday, December 16, 7:30 pm in the Main Nave. When Constable was designing Saint Dominic’s, he worked under the rubic that the Church is a homily made of stone. Well, today, we watch him preach. 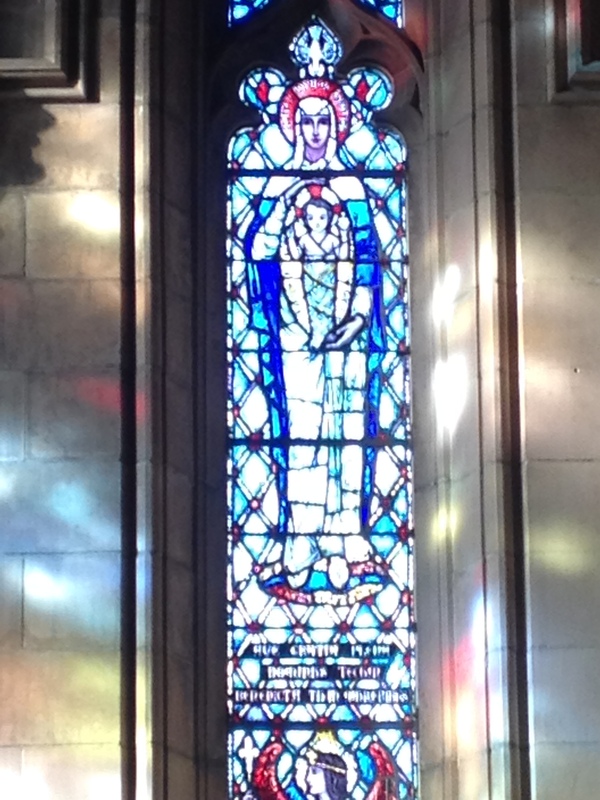 On the Solemnity of the Immaculate Conception of the Virgin Mary, we take note of a window left of the sanctuary. It is the Immaculate Conception window. 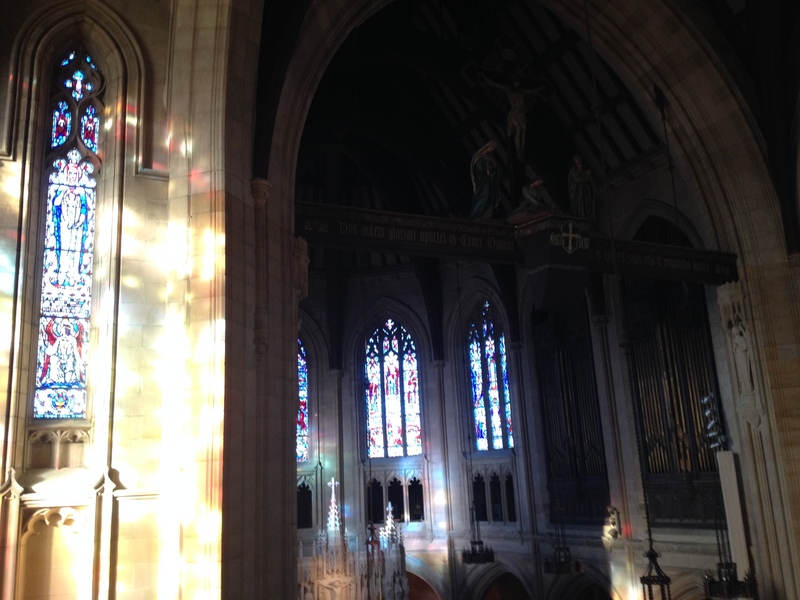 Of course, taking good pictures of the windows is almost impossible, but perhaps these sorry pictures may inspire you to take a visit and mediate on these windows in real life. I would also like to point out that to the right of the Immaculate Conception window is a statue from a previous version of Saint Dominic’s…namely, a statue of the Crucifixion of the Lord, with Jesus’ Mother standing next to her Son. Without her yes, there could not have been His yes. Without her fiat, His Death would never have happened. Immaculate Mother, pray for us. 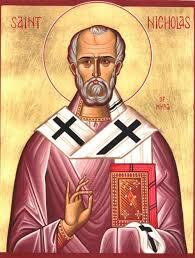 Today is the Memorial of Saint Nicholas, Bishop. Many think of Saint Nick—Santa Nicolaos of Myra—as someone’s figment of imagination that somehow ended up on Coca-Cola bottles and tins of popcorn. Actually, this Saint was a real man. He actually existed. Yes, Virginia, there really is a Santa Claus. Now, anyone reading this blog can look up Saint Nicolaos’ biography on their own. However, I would like to “read” the attached icon and allow us to see how we got from this icon to the American counterfeit. Now, with a Catholic Liturgical lens, you would think that Saint Nicolaos was a martyr. In reality, Saint Nicolaos lived in modern-day Turkey. He was Orthodox. The color palette of the East is much different than in the West. Whereas the West delineates colors for a particular purpose—green symbolizes hope, white for resurrection, red for martyrs and the Holy Spirit—the East has two color schemes, light and dark. Dark is for the darker seasons, like fall and winter, and light for spring and summer. (Needless to say, this is a gross simplification. My apologies.) Saint Nicolaos died on December 6, 343, during the darker months. Hence, a darker color, like red. Now, notice the pallium over Nicolaos’ shoulders. (The pallium is a woolen stripe recognizing an archbishop’s authority over his region.) Now notice its color. Now think of Santa Claus, particularly of that furry stripe going down his chest. Interesting, hunh? Okay, now what about the hat? Santa Claus as a funny triangular hat. Well, so do bishops. What is now deemed a “Santa hat” is really an adaptation of a Bishop’s Mitre. I find it fascinating that many of our American Christmas customs are deeply rooted into our Christian tradition. I hope you found this as fascinating as I do. More importantly, I pray that you find time today to venerate this very special and holy man, asking him to sanctify this day, this season and your life. 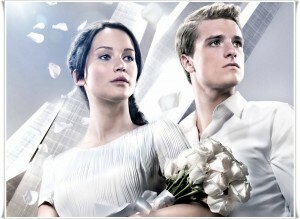 The Hunger Games: Catching Fire, the second movie of The Hunger Games trilogy, is the hottest movie out there right now. Reading the books a number of times, I can say that I was quite satisfied with the adaptation. 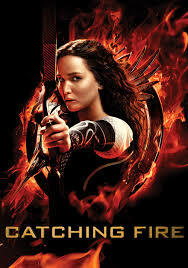 In fact, I thought that the movie adaptations of The Hunger Games and Catching Fire were both rather effective. Nicely done. Recently, I overheard a conversation in which people were talking down the movies, saying that they are instruments of gratuitous violence. The argument stemmed that the world is a cold, awful enough place as it is, and really, why should we watch and promote films that bring our spirits, down, down, down? And to a point, I agree with the conversation. Christians—at our best—are a hope-filled people, children of the Resurrection. We are people with our hearts and minds focused on the face of our God. We trust in a God who will never let us down, a Father who will always keep his promises, and a God who knows us so intimately that he provides us with what he need at the perfect moment. So yes—why ought we focus on downtrodden movies? They have a point. Admittedly, though, when I heard the aforesaid conversation, I rolled my eyes (I never said that I am a nice person) I thought, You fools. You fell right into the trap. Right. Into. The. Trap. In fact, if you have read the books, the first thing you would notice that author Suzanne Collins is doing is rallying against reality television, child violence, media manipulation, and propaganda. The purpose of the books was to elucidate and project onto a wide screen the very thing that makes our society weak—the objectification of the young, propagandistic manipulation, entertainment for entertainment’s sake, a squandering of resources, and the list goes on and on. The Hunger Games trilogy is a story about a normal girl trying to protect her family—the whole gratuitous violence thing is exactly what Collins is rallying against. Now, I’m not writing this simply because it stirred my pot. Whereas the Kingdom of The Hunger Games is founded on manipulation and intimidation, the Kingdom of God is not. The Kingdom of God is founded on Charity, Peace and the Love of God and Neighbor. Unlike President Snow, who rules by treachery and forceful, robotic Peacekeepers, Lord Jesus rules through urgent invitations, loving concern and joyful spirits. It may be easier to be feared, but it is much better to be loved. Thankfully, the Kingdom of God is not Panem. Christians at our best are a people responding to the invitations of Jesus Christ to dwell deeper in faith, hope and love. Children of the Resurrection, we are formed by the radical example of the Son of God, loving desperately and passionately to the point of dying to our selfish ways. We are not ruled by a sadist, but by a The Crucified. He invites us to love and to love in the most extreme of ways. Collins does not give into a world of gratuitous violence, manipulation and media fanaticism. Rather, she forces us to look into the mirror, and forces us to answer for the manipulations we make of our own selves. How do we use each other for our own selfish gain? How are we killing our society and our own children? How are we murdering the innocent youth of our times?